“A happy, festive crowd has arrived to Hungary” (photo: Orange Files). 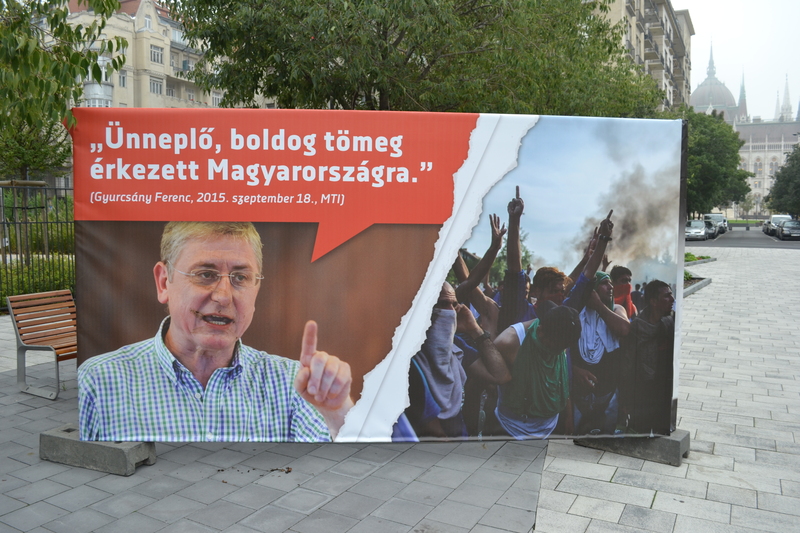 On October 5, 2015, the pro-government political organization Civil Cooperation Forum (Civil Összefogás Fórum, or CÖF) erected twelve signs at a park near the Hungarian Parliament Building in Budapest juxtaposing images of opposition political officials and aggressive or seemingly aggressive migrants (see CÖF website in Hungarian). The signs also display migration-related quotes which the depicted democratic opposition officials have made over the past few months and which radical-nationalist Jobbik President Gábor Vona—who supports the Orbán government’s current migration policy—made during the previous parliamentary cycle. 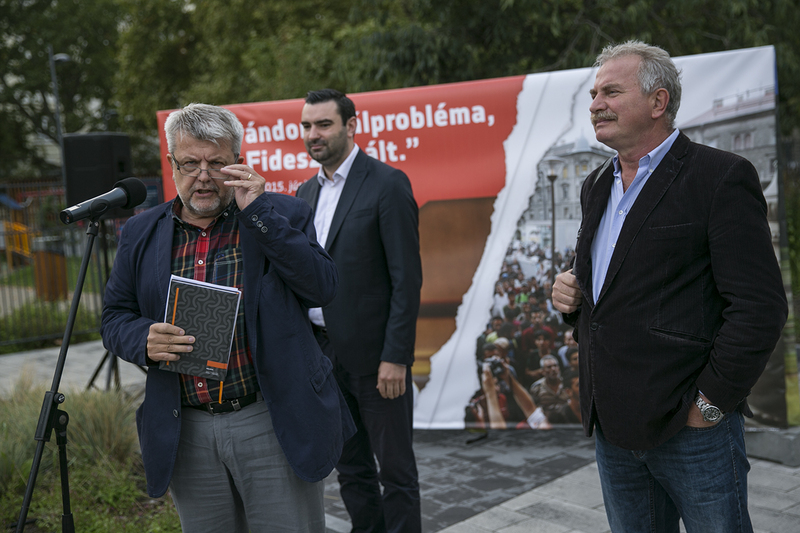 CÖF officials including President László Csizmadia (left) introduce the organization’s new signs at the Olimpia Park in Budapest (photo: 444.hu). Most of the signs depict migrants in Budapest during the Eastern Railway Station crisis in late August and early September and at the Röszke border crossing along the Hungarian-Serbian frontier during a clash with police on September 16—the single violent confrontation involving migrants in Hungary since the beginning of the Great Migration. Below are Orange Files photos of the signs and translations of the displayed quotes. Note: Fidesz-affiliated foundations have provided much of the Civil Cooperation Forum’s financing (source in Hungarian). Opposition media has speculated that CÖF is also the recipient of indirect government funding through the likewise László Csizmadia-led National Cooperation Fund (Nemzeti Együtműködési Alap, or NEA) (source A and B in Hungarian).